Fun Express Train Station Toddler Combo Bounce Rentals in the Rockville, Gaithersburg, Potomac, Montgomery County and Maryland area. 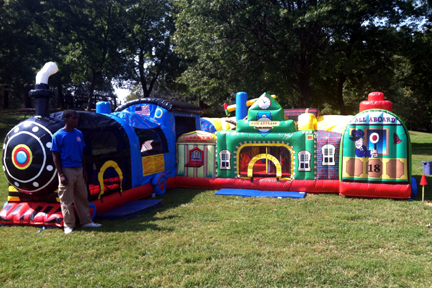 The train is at the station with this adorable and colorful Fun Express train station inflatable obstacle course. Once kids enter through the front of the train, it's on to gentle climbs and whizzing slides, under upside-down obstacles, and maneuvering around pop ups. Once in the interior of the station, participants are greeted by a 3D palm tree and a train signal pole. The exterior art makes kids feel like they are at a real train station, with a ticket booth, a detailed train and even a clock image to make sure the train is on time! This inflatable obstacle course can be an amazing centerpiece for an indoor or backyard birthday party. The inflatable play structure begins with a front-loading obstacle entrance, taking participants through tunnels and pop-ups to facilitate maneuvering skills and build confidence. The challenge obstacle then leads to an exciting climbs and slides, all to guarantee hours of enjoyable physical activity. Each inflatable play structure has mesh windows for easy viewing by the parents. Includes inflatable unit, 1 blower, and 1 attendant. Requires electricity (110 volt, 11 amps) and 20'l x 27'w x 8'9"h space. The train is at the station with this adorable and colorful Fun Express train station inflatable obstacle course. Once kids enter through the front of the train, it's on to gentle climbs and whizzing slides, under upside-down obstacles, and maneuvering around pop-ups. Once in the interior of the station, participants are greeted by a 3D palm tree and a train signal pole. This inflatable obstacle course can be an amazing centerpiece for an indoor or backyard birthday party. Includes inflatable unit, 2 blowers, and 1 attendant. Great for ages 2 - 7.